Across the street was a steep upward bank and an area to the south had been excavated for a small one-floor apartment building. There was also a side road on the further side of Route 7 that merged with northbound Route 7 across from the Albany-Binghamton terminal. We moved to Plant 5 in the late summer of 1973. This is the Arterial Highway looking south from Plant 5 and is one-way only. To the left is route 7 that is a divided highway. I often rode my bike to work in the summer. It was 7-1/2 miles each way and took an average of 35 to 40 minutes travel time to get there. I like to get outside at noontime and get some exercise after sitting at a desk all morning It also provided a way to have a change of scenery and get away from the telephone. I have had several different adventures since moving here from the main plant. I went walking almost every noon time regardless of the weather and made many interesting discoveries in the nearby countryside. My noontime excursions can be separated into several different areas: the field, The Chenango River, the Barjo Woods to the south or across the street to the old farm. Some days I walked about a mile down the arterial highway past Barjo Trucking Service to Fred’s Hardware store to buy supplies for the lab. I had a company charge account there. I liked to explore new areas that were out in nature and this was a whole new adventure. Of course, there are always many subjects around us if we take the time to look. Most people pass them by unseen and hurry on intent on other business. I took hundreds of pictures while working at Plant 5 so that I could remember what I saw. I could almost always identify the flowers and trees that I found in reference books and some things were new that I had never seen before. 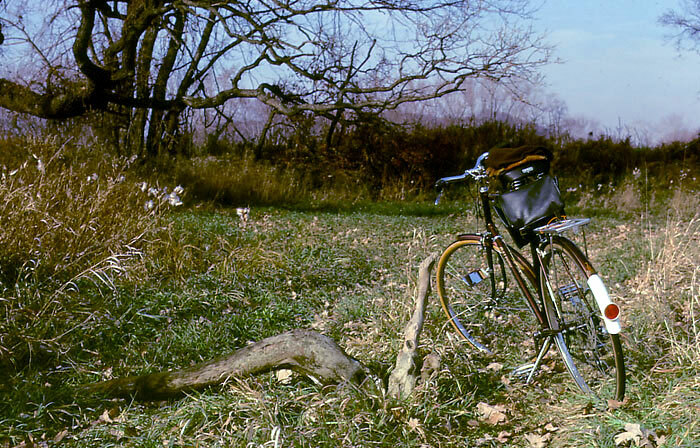 My first noon-time adventure was in the fall of 1973 soon after we moved there. I crossed the field westward to a wooded area. I always brought a camera with me on adventures like this. Looking back to the east, I could see Plant 5, the blue building in the center with the trailer backed up to the loading dock. To the left is the Interstate trucking terminal. The field was relatively flat and walking across was easy in the fall. I soon became a hunter of photos with so many opportunities around me. 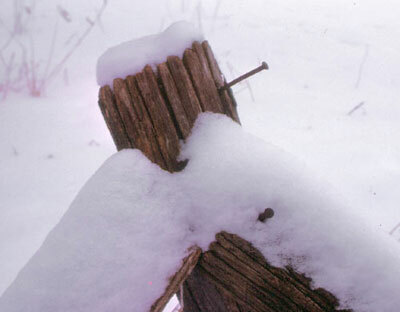 One of my first photo finds was this old wooden fence post standing alone at the far end of the field. 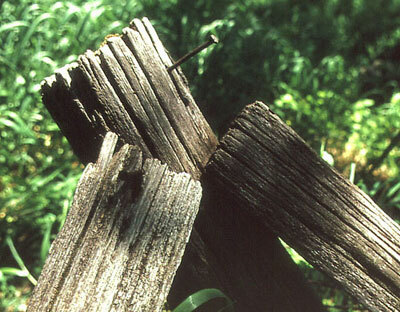 There was no evidence of any other wooden posts. 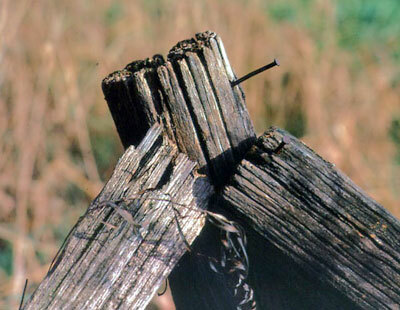 However, there were pieces of barbed wire attached to it as if the wires went to another post somewhere not far away. There were also a lot of vines that had been climbing around the wire and post. Perhaps they had accumulated over the years. Before taking a formal picture, I cleaned off some of the vines and straightened up the post. 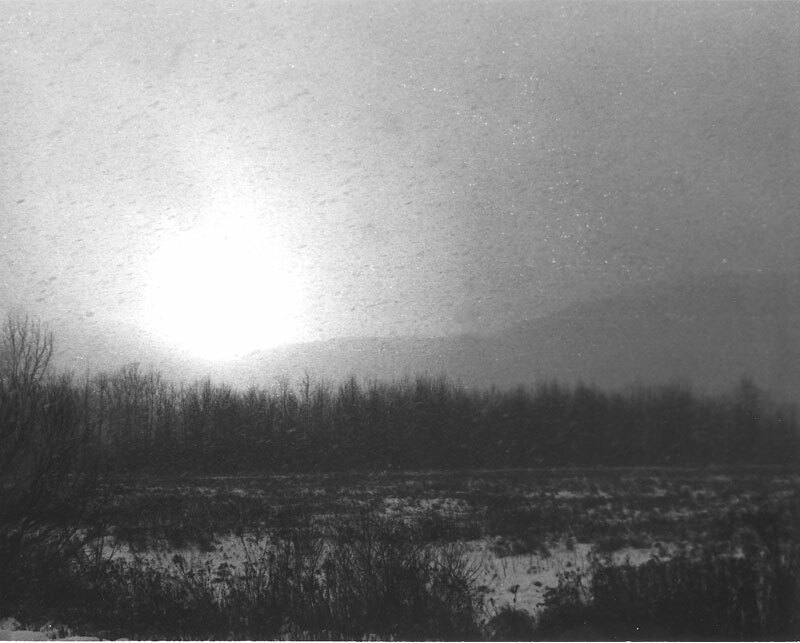 I later sent this B&W picture to a photo invitation in the Binghamton Press and Sun Bulletin paper and it was published. 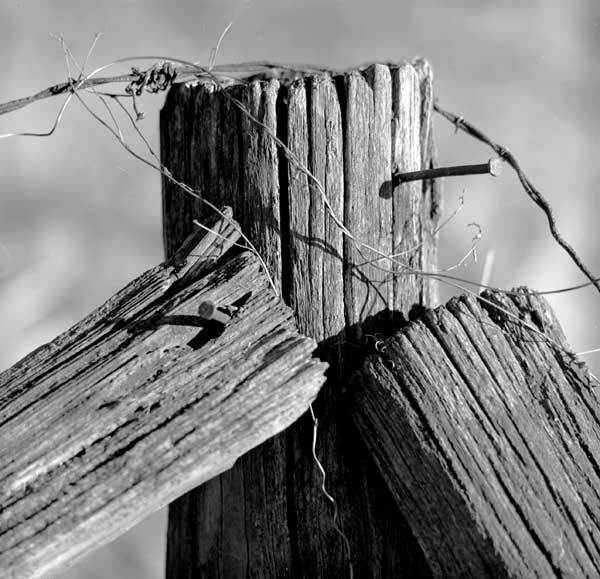 Over the seasons and the years, the post survived. I took many pictures of it and thought that a four-season set of pictures would be interesting. Here it is with its different conditions. Looking west and next to the old fence post were two large oak trees. From the leaves on the ground and the bark, I identified the trees in a book and found they are called Burr Oaks. I estimated the trees were probably 100 or more years old. The hills in the background are on the other side of the Chenango River that is further to the west from here. Of course, in the late summer the trees had a very different appearance. A honey bee nest was in the rotted bottom part of the right hand tree and only a few feet above the ground. That was a good place to stay away from. I wondered if bears had discovered this. The field was big. Here is a wide angle view from Plant 5. If I walked straight across to the trees in the distant center, I would arrive at the Burr oak tree and fence post. The lighter areas in the distance are actually buildings on the other side of the Chenango River. These formed what was called the Northgate Plaza. In the foreground are phlox plants in bloom. To the left close by is a lower area where the iris-like plants grew. In the summer, when the grass was tall or was wet from rain, there was a path I could take to the woods that must have been worn down by people going to the river. 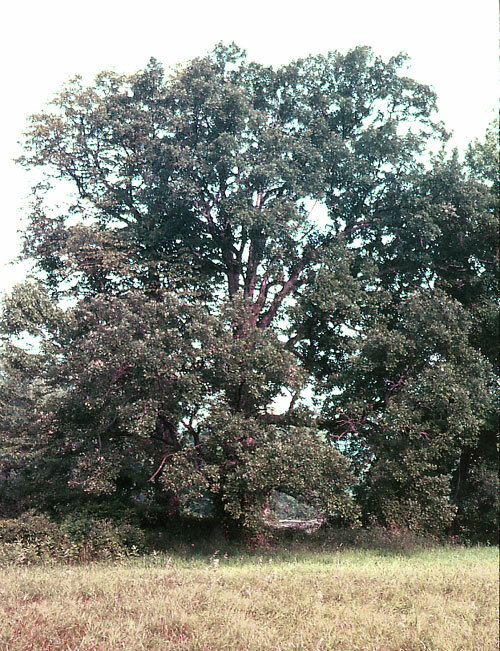 It was at the south end of the field and ended up by the twin oaks. Although people must obviously have been there at other times, I never saw anyone else in all my noontime excursions across the field. In the spring or after lots of rain, the Chenango River floods and even reaches over here to Plant 5 through a lower portion of the field but the building is high enough and we never had a problem. This is a telephoto shot looking in the same direction. 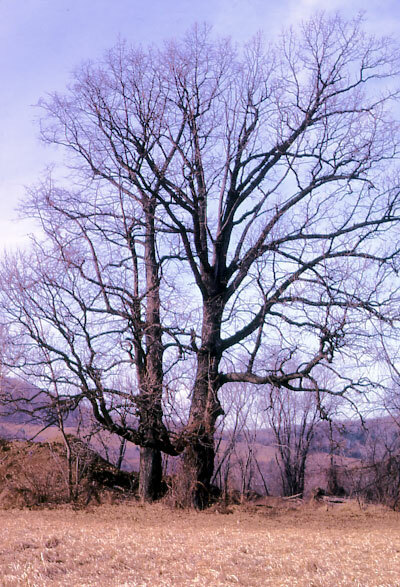 The twin Burr Oaks can be easily seen at the left portion of the distant trees. I like to move around to find a spot that makes an interesting picture and was attracted by the contrast of the weed and grass color against the dark background of trees, Dampness seems to bring out the colors better. Like many other scenes and even people, we see them in different light and different circumstances. Here we see in the field only the portion that is up close and the true color, depth and scale are hidden from our view. One fall there was an early snow and caught many of the colored leaves still on the trees. This is a view from the back of Plant 5 and looking west. The snow-covered weeds that bordered the driveway area made an interesting shot. In the winter, the low area next to the building still has water in it that freezes at the top and then recedes. 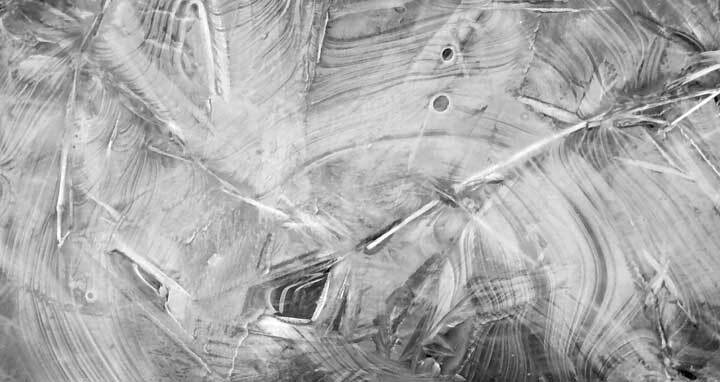 What remains is a few blades of dead grass that holds the thin sheet of ice in place. Here is another one of those snow flurries late in the afternoon. I took the picture through a window in one of the loading docks. It looks like a scene somewhere in Alaska with snow already on the ground in the field, the leafless trees and what could be mountains in the distance. 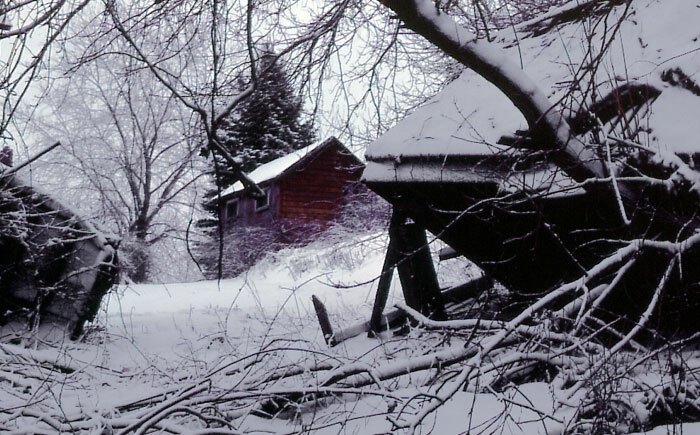 We didn’t get many visitors at times like this way up north of Binghamton. My rarest find is the Green Dragon. 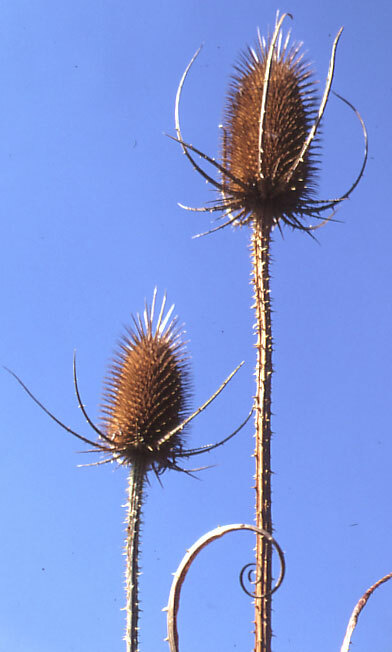 This is a most unusual plant and it stands about 30” tall. 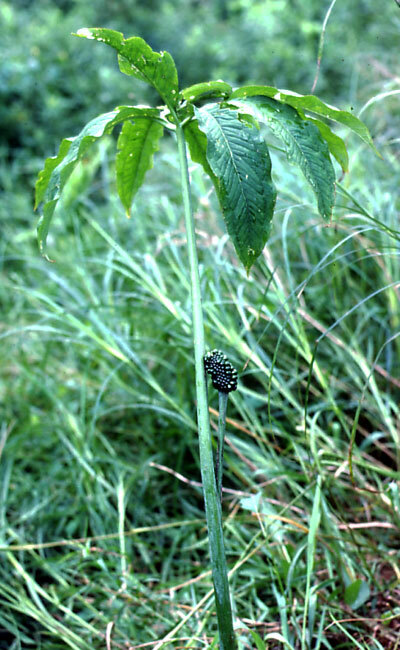 It has a cluster of leaves at the top and halfway down on the stalk is a branch and cluster of seeds. 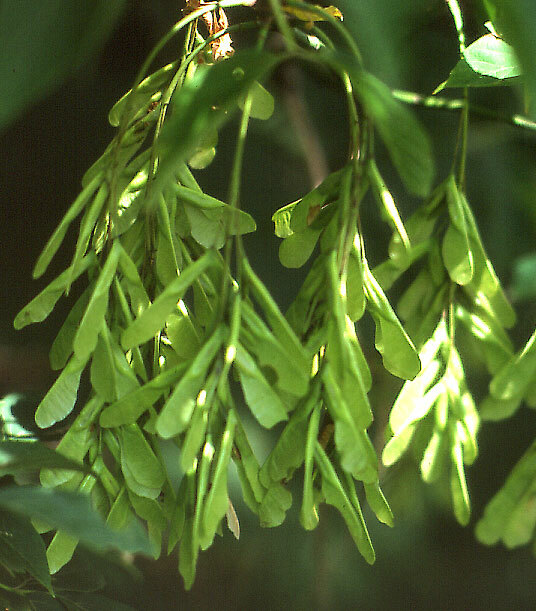 The seeds turn red later in the summer or early fall. I learned later, after identifying the plant, that there had been a single green flower-like hood something like a jack-in-the-pulpit. 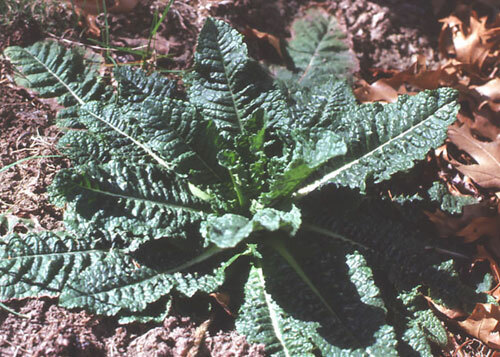 In fact, the dragon is related to that plant. 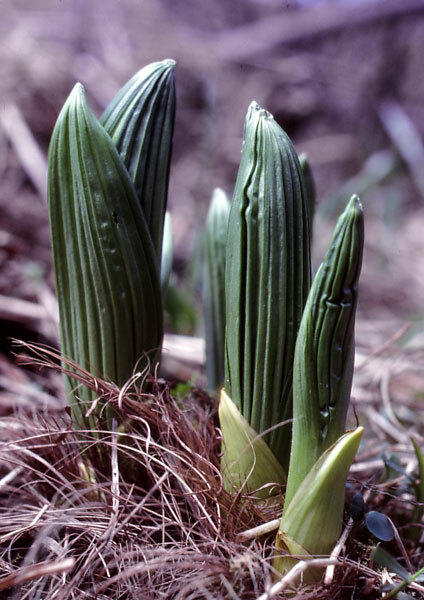 The greenish stem (spadix) that was in the center of the dragon hood was long and thin. Sometimes it can extend as high as the leaves. The hood and stem had fallen away by the time I found the plant. With all the tall green grass in the field, it is easy to see how I could have missed it when it was younger. The Dragon is found in the entire eastern half of the United States. 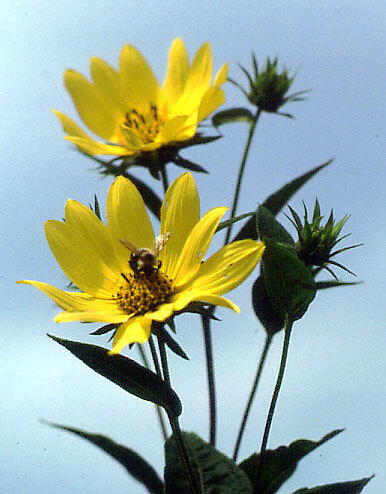 It is considered to be a wild flower and grows best in part or full shade. 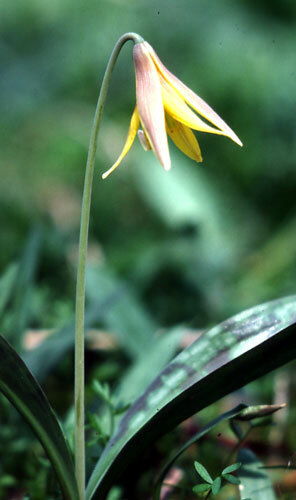 This spectacular spotted lily was also found in the field. 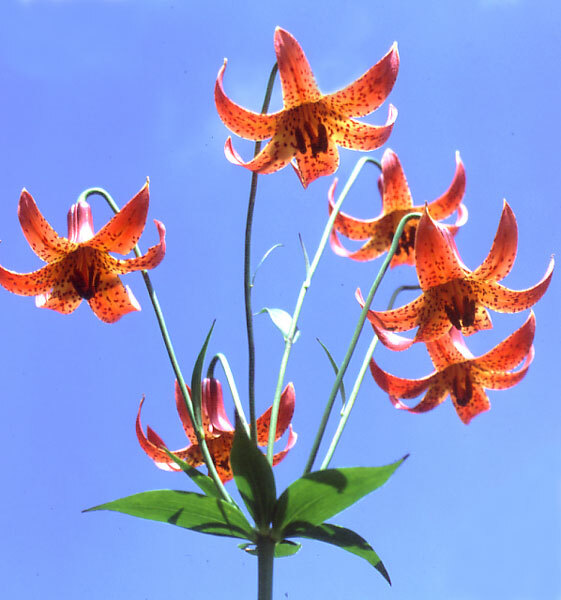 It is closest to the Michigan Lilly but is also similar to the Turk’s Cap Lilly. 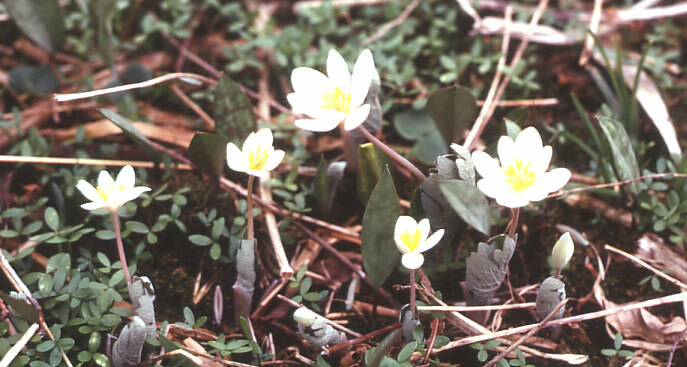 Both have bell-like downward facing flowers. The intense blue sky and low angle shot made a very interesting picture. At first I thought this was some kind of wild iris but later learned it is called a Larger Blue Flag (iris versicolor). 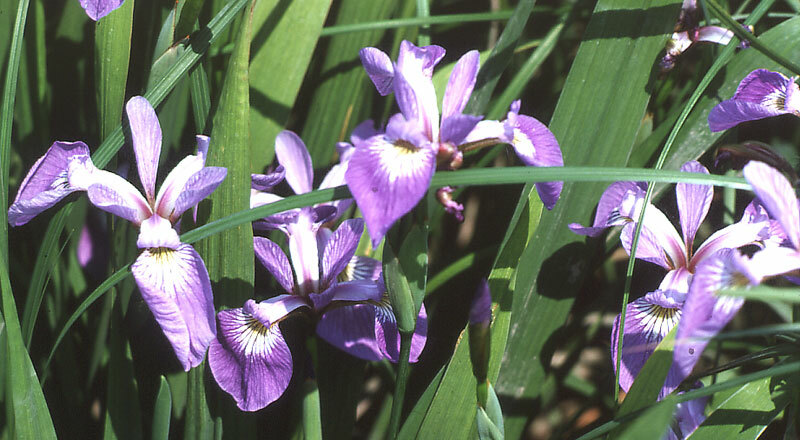 Larger means the leaves are much broader than the Slender Blue Flag version (iris prismatica). This was growing in the swampy area of the field next to Plant 5 and nowhere else in the entire area. 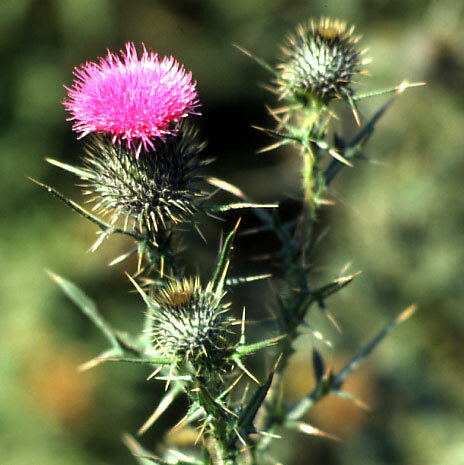 Thistles were also very common. The finches loved to eat the seeds in the fall. They grew behind the building. The thorns are very sharp. This is a wild sunflower. They are about 60 different species. When sunflowers are mentioned, we think of the foot-wide ones like those grown in Kansas, These are more like large yellow daises. Note the bumble bee in the lower blossom. How many of you have seen these plants along the roadside. 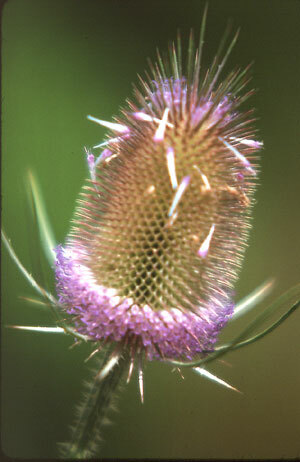 They are called Teasels and are popular for flower arrangements or even crafts. Here is one in bloom but most of the flowers are gone. This became one of my most fascinating and favorite finds. 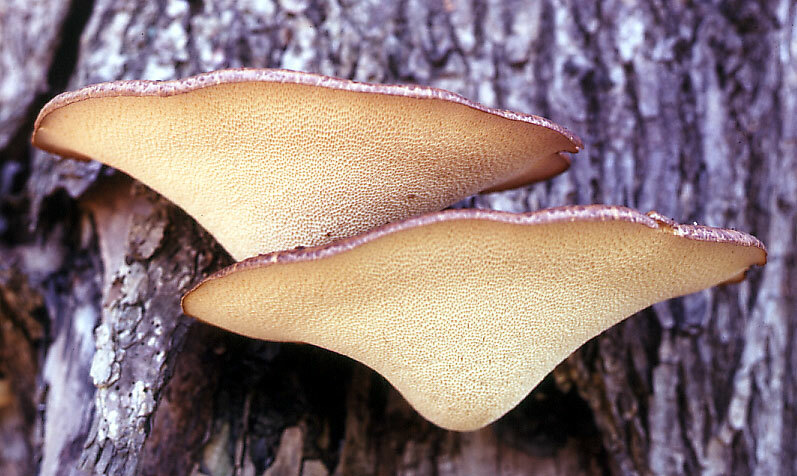 The first year, the plant only grows low to the ground and spreads out 8 to 12 inches. The second year it takes off and grows to be about 3 feet high with several blossoms. They grew behind the building. This is possibly a wild parsnip. There were several of these out in the field. Each cluster of flowers is arranged in a sphere and then each group within a cluster is also arranged in a sphere. 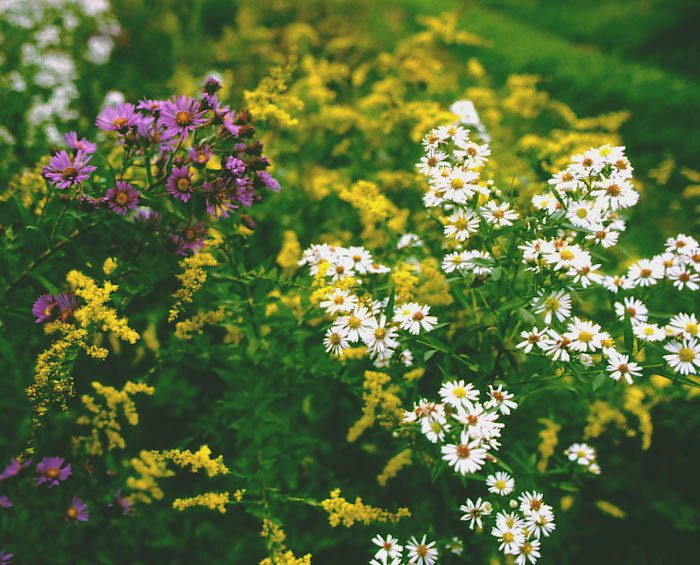 It means that the flowers have a maximum exposure to bees or other insects from all directions. 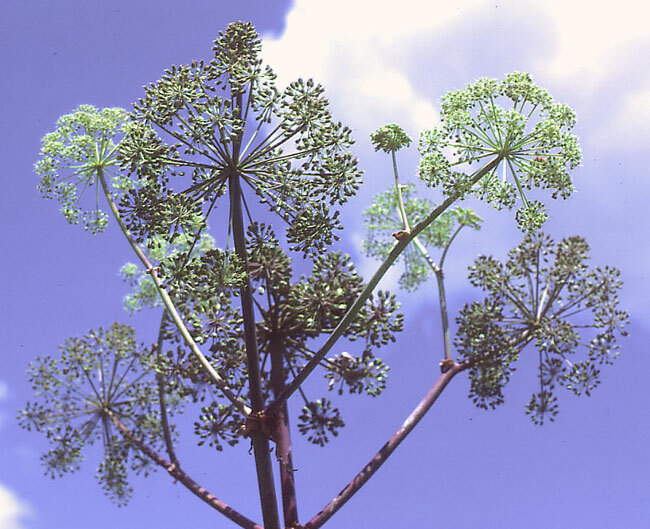 The plant is 3 or more feet tall. Of course, no field would be complete without some milkweed. 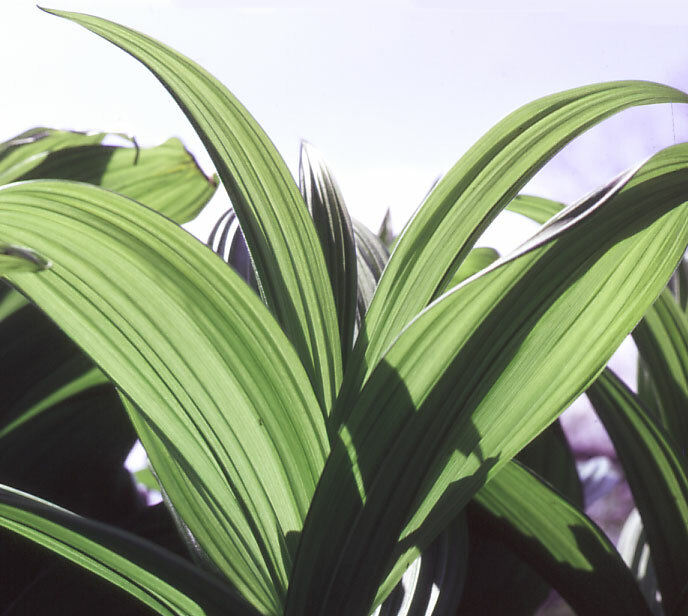 The plants range from 3 to 5 feet tall. 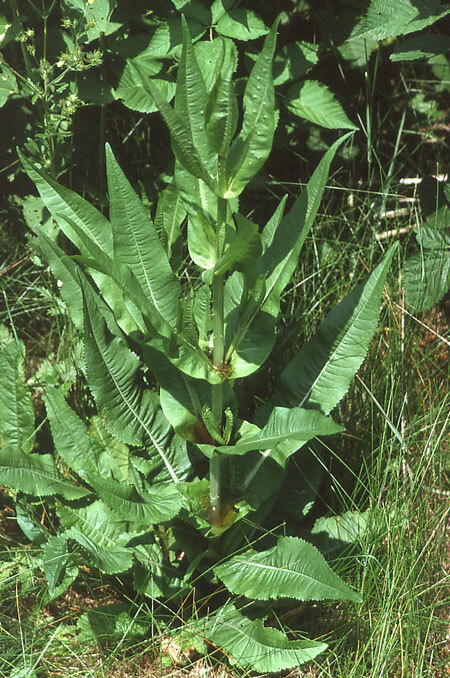 The plant got its name from the milky sap in the stem and leaves. It is also the exclusive food for the Monarch butterfly larva. Although I looked, there were no larva to be found. In other places I had often found a chrysalis that the larva transforms into and brought them home to witness the butterfly emerge. 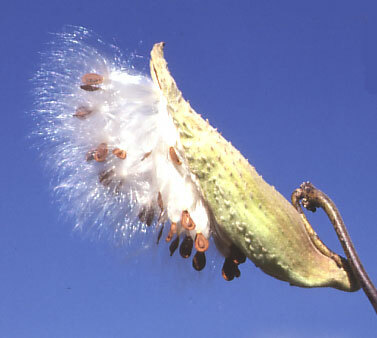 In the fall, the pods open and the wind can spread each parachute carrying a single seed to places far away. About this time I purchased a good quality air rifle to replace the Sheridan pump type that I had used earlier. The accuracy of BB rifles is not that great. The new rifle is a Feinwerkbau 124 spring driven .177 caliber pellet type that was made in Germany and sold by Beeman’s. Since the field behind plant 5 was very secluded. I occasionally did some noon-time target practice in the field behind the building and beyond some trees. I soon learned that the open sights that came with the rifle did not do justice to what the rifle could do. This is a single shot weapon with a rifled barrel and a muzzle velocity of 950 fps, rivaling the .22 caliber cartridge type. I decided to get the recommended scope and that increased the accuracy tremendously. 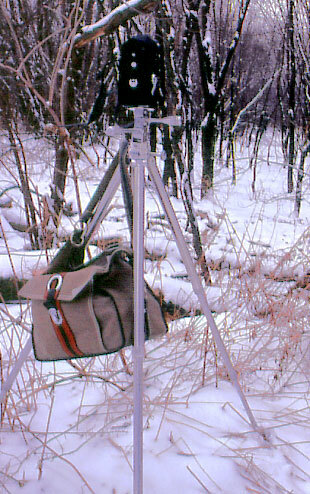 A sling was also added to give better stability when standing or sitting. I adopted the same sitting position as what I had used when firing the M1 rifle at Fort Bragg where I shot expert. 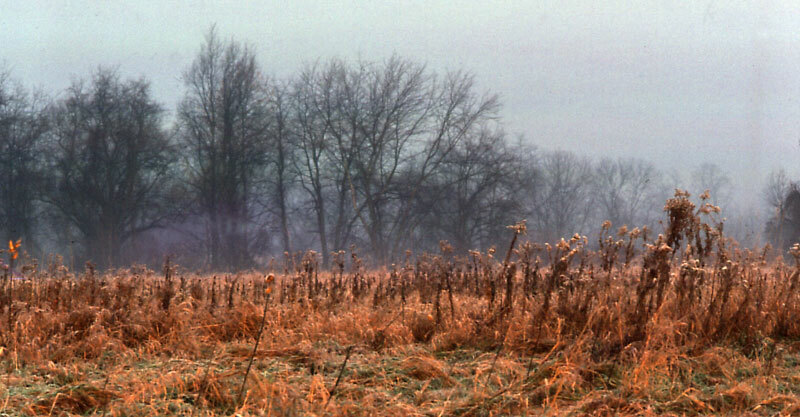 As a result, I was almost hidden in the tall grass in the field and the rifle made very little sound. Later, a .22 caliber version became available. Since I planned to do mostly target shooting, I decided not to change. The weight of the .177 pellets I was using averages 0.47 grams or about 7.1 grains but others are available as high as 11.5 grains. 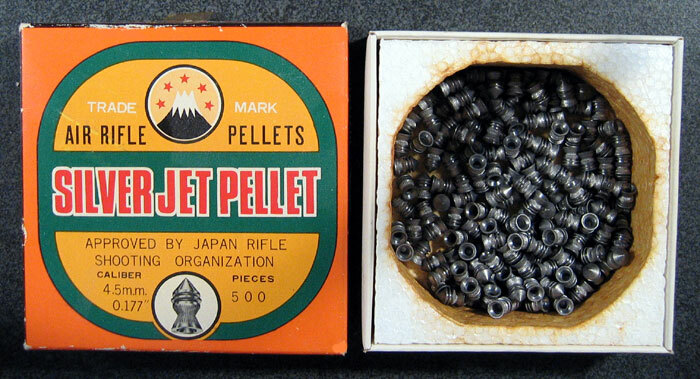 Pellets for the .22 caliber air rifle are available up to 21 grains. The higher mass has greater impact energy for the same velocity. Bear in mind that inertia only changes directly with the mass but increases as the square of the velocity. In comparison a .22 caliber cartridge bullet weighs from 2 to 2.6 grams or 30 to 40 grains. The standard target for air rifles is for a distance of 25 feet and the outer circle in the target is 1-3/4” in diameter. 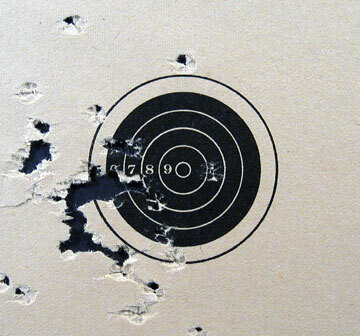 This is the target I used to make scope adjustments. The same target size is normally meant for use at 50 feet with small bore rifles but these air rifle shots were made at 25 meters or about 61 feet. The scope still needs a slight correction to center the cluster properly. Under ideal conditions Beeman’s stated that the rifle could have a spread of ½” at 50 feet. Pellet shape is also a factor in accuracy. I used the Japanese Silver Jets. These have a conical point and are more accurate than the blunt nosed type. I took this picture on a fall Saturday afternoon near the Burr oak trees. I followed a path through the field from the road and had found an interesting piece of driftwood near the river but decided it would not be that interesting if I carried it home as a decoration for the back yard. 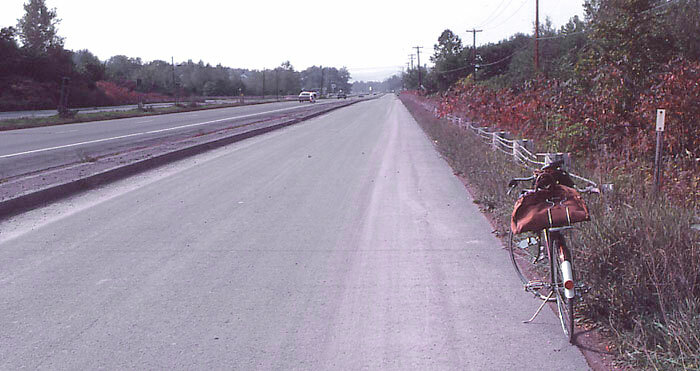 I often rode my bike on weekends as well as to work. In the wooded area across the field, I found several different kinds of plants. These are called bloodroots. They grow from bulbs in the spring. If the “roots” are cut a reddish sap will flow giving it the name. The flowers are about an inch across. Another common flower there is the Trout Lilly, perhaps named for the speckled leaves. This also appears in the spring and it grows from a bulb. Another appearance in the spring is Indian Poke. It starts growing early, flowers and then is all done by summer. 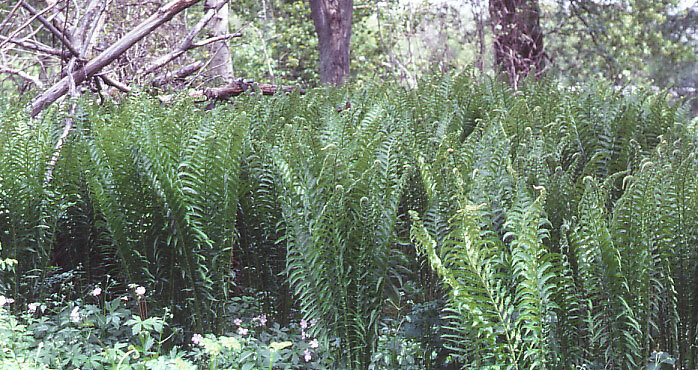 By summertime, the ostrich plume ferns have reached their height of about three feet. One day, while moving through the thick underbrush, I spotted a young deer. I stood still for a long time but the deer finally decided to run off. I never did get a picture and could barely see the deer through the brush anyway. 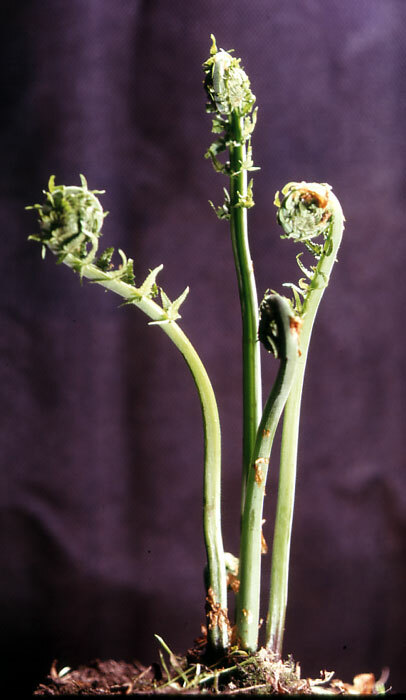 It was difficult for me to photograph a single plant and show the fiddleheads uncurling. So I dug one up and brought it home to photograph with a dark background. Later, I planted it in my wildflower garden. This was a new discovery. I had never seen one before. 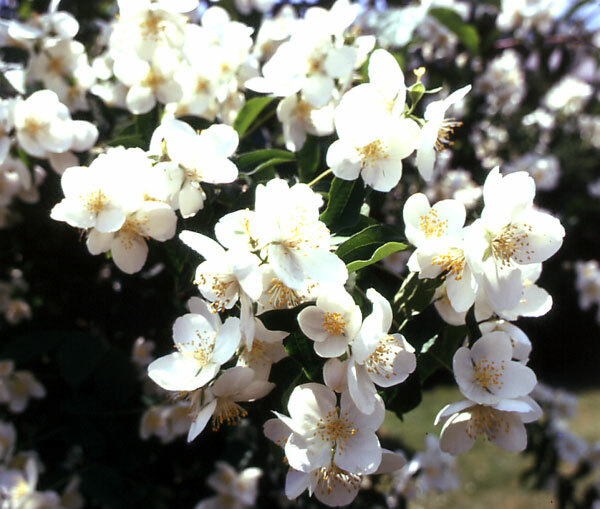 It stands about 8 inches tall It has two umbrella-shaped leaves and in the late spring between the two leaf stems a white waxy flower appears that later bears a single fruit about an inch or more in diameter. In this picture, the flower has not yet appeared. 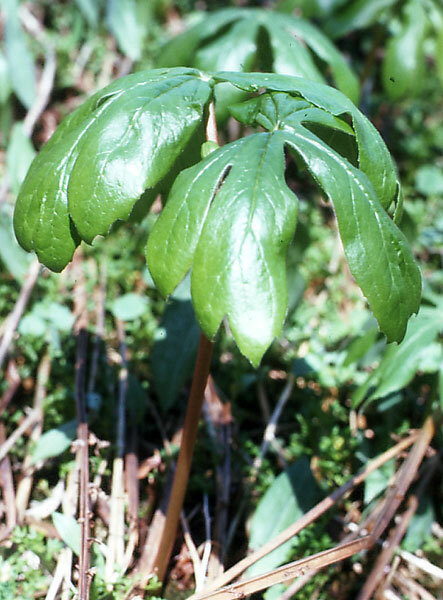 The plant is called a Mandrake or Mayapple. 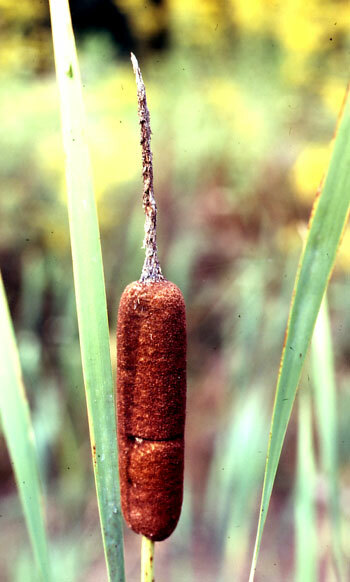 Closer to the Interstate building was a small swampy area that had several cat tails growing in it. The brown part is about 3 or 4 inches long and about an inch in diameter.I had brought a couple of these over to a puddle area behind Plant 5 and broke one open. There are thousands of tiny parachutes carrying seeds that will drift in the wind. To my surprise, a few years later, several cat tail plants were growing there. Of course, you would not want to walk into one of these spider webs out in the tall grass, particularly when it is complete with spider. I found this near the cat tails. The white trail is a unique signature of the Garden Spider. When seen from the back the spider is yellow and black and about3 inches long. Here is a picture taken in the fall when the flood control area has receded some. 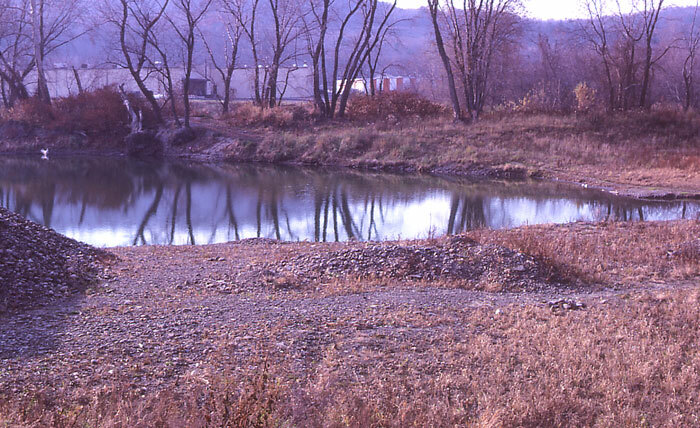 The river bed gravel is being taken and used for construction projects in the area. Part of the Northgate shopping plaza buildings on the other side of the river can be seen more clearly now. In the summer, there is no river current in the control area. A rope with a knot at the end is hanging from the leaning tree. It didn’t take much to figure out that it is there for kids to swing on and drop into the water. When the river is low, I could walk in the control area and see that the grass and twigs have all been swept in one direction. I wonder if a person would be able to construct such an arrangement as this. Perhaps this natural formation would make a good photo or painting. Once, I found a group of stones so perfectly arranged that I wanted to save it and dug it up. Later, I was not able to reconstruct the arrangement and should have photographed it first for reference. Perhaps, given enough time, though…….. I wondered how long it had taken for the original arrangement to be formed—a day, a week, a month, a year…? More evidence of river action could be seen. Rounded stones were everywhere. There were areas of sand, dead branches and a few man-made things like paper bits, plastic and aluminum cans. I always looked for unusual stones and then an idea came to me. 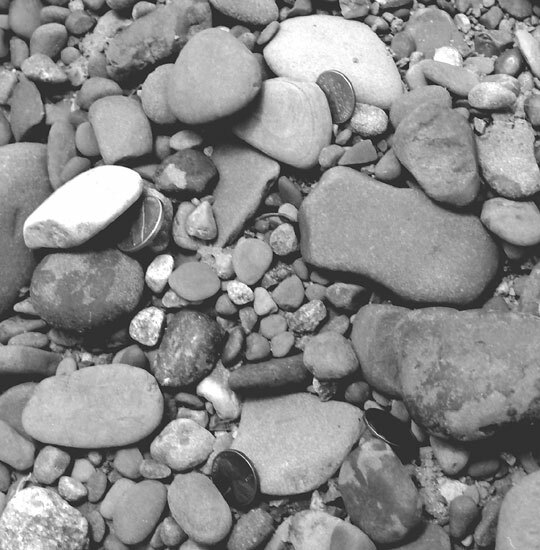 It might be exiting to find money that had been deposited among the stones the last time the river had flooded. In case I never found any, I added 17 cents for the picture. It is sort of symbolic. Some people say finding money is like a symbol in a dream for finding love. 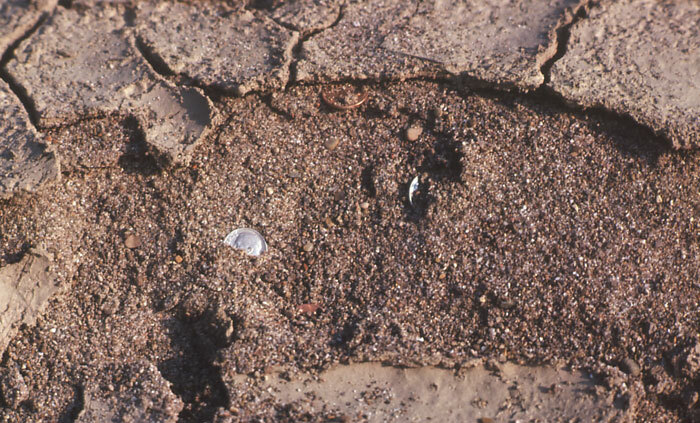 Even in dreams, lifting up a piece of dried mud crack, shown below, might yield a reward. I never actually found any money here and did not expect to but I just had to see what it might look like. In winter, looking north, the control area begins to resemble the arctic. 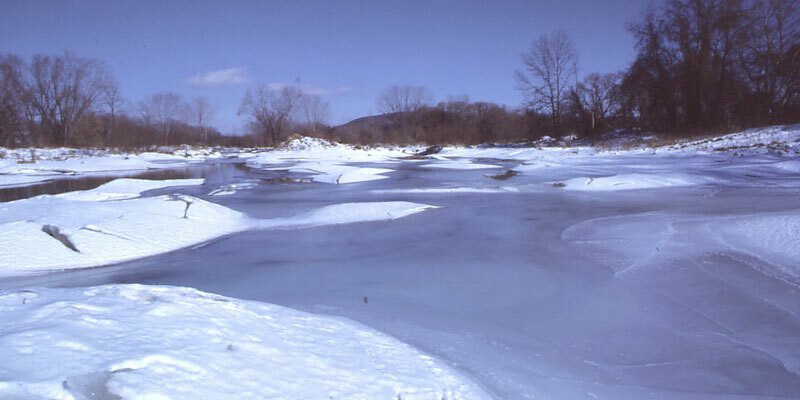 The area had been previously flooded and then frozen. Cracks have appeared in the snow-covered ice as the river receded and some areas have actually sunk down.. 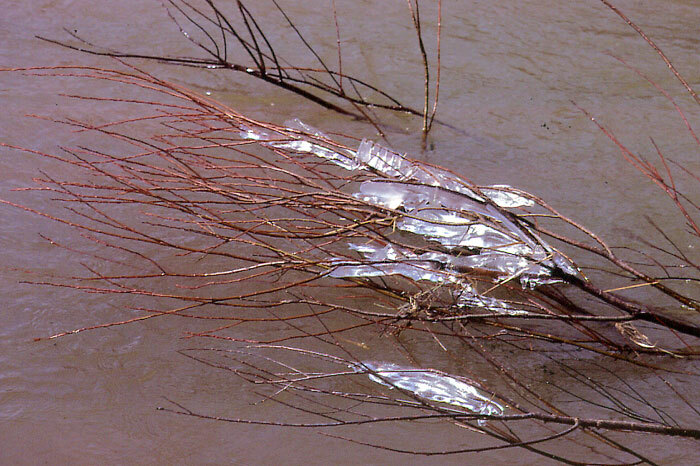 Here is a river-swept branch that still has ice clinging to it. This did not seem to be part of ice that had once been in the entire area. It looked different. Perhaps it was a very slow processes and had occurred when the air temperature was below freezing but after all the river ice had melted.. In other places, broken branches were pushed into the trees several yards above the ground. It was obvious that the river had been much higher in the spring and covered the land behind the woods. Some trees looked as if they had been hacked with an axe or something at several feet above the ground. It was more evidence of flooding but this damage was caused by large ice chunks battering the trees in a springtime thaw when the river was very high. 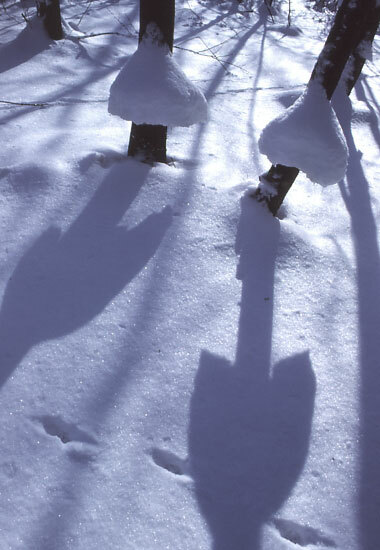 Each time a large block of ice hit a good sized tree, the whole tree was badly shaken. I could appreciate the forces involved and was glad I did not live near a river. I had seen the results of earlier ice jams in the Susquehanna River across from the main plant. 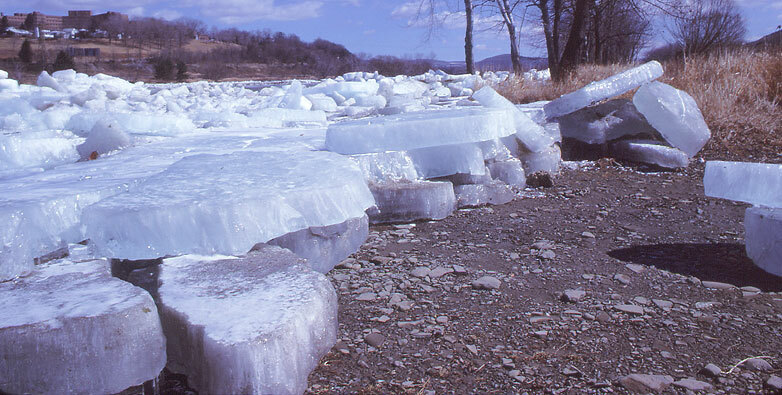 The forces were so strong that huge blocks of ice weighing half a ton or more could be forced up and onto the river bank. Sometimes pressure was so great that they could tossed into the air out of the river and slide across the ground for 20 or 30 feet. It was so cold on the day I took these two pictures that the battery in my Nikkormal camera must have frozen. I had to guess at the exposure and it wasn’t always right for so many white areas. After that, on very cold days, I kept the camera inside my winter coat. Sometimes I would walk to the south down the side road called Arterial Highway. 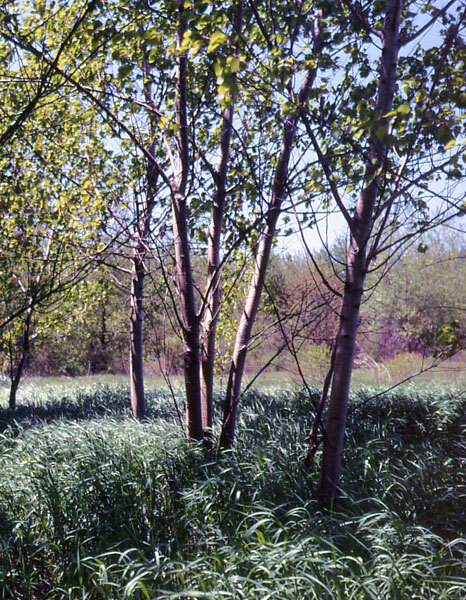 At the south end of the field, there is a nice group of cottonwood trees. In the spring the grass is just beginning to grow. 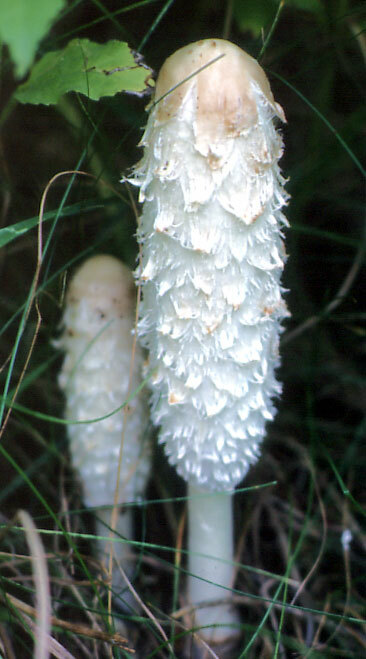 In the summer, many little white floaters come from the trees and blow across the road in large quantities. Also along the road was a single maple tree showing many green “copters” not yet ready to take wing. It appeared to be a Silver Maple. 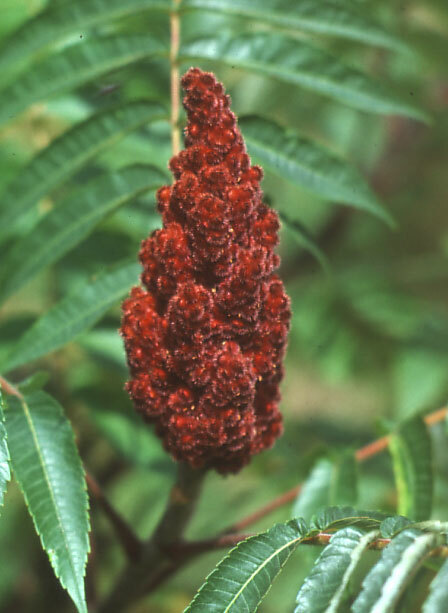 During the summer, the Staghorn sumac also grows along the road. It gets it’s name from the fuzzy shape resembling a new horn on a stag.. In the fall, the leaves turn a bright red color. 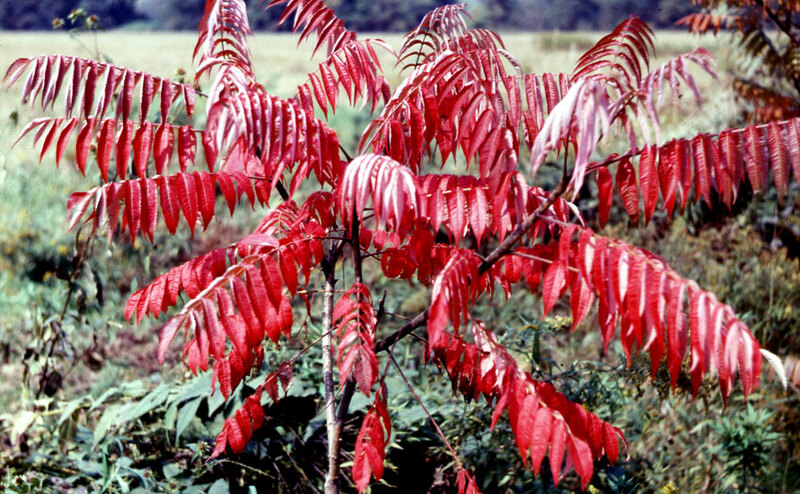 This is not related to poison sumac. Beyond the end of the field to the south there is another woods and then the Barjo trucking service area. I refer to this area as the Barjo Woods for convenience. In this area were more fascinating photo subjects. 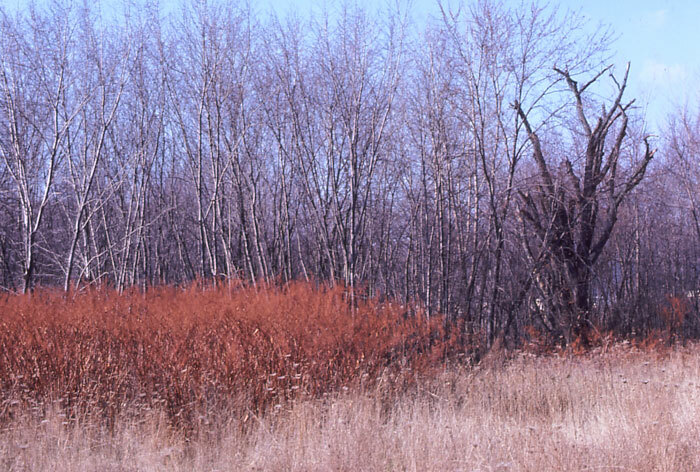 Looking to the west from the side road, there was a small field and an area of ironweed that had turned reddish-brown in the fall. Behind that are many smaller maple trees. 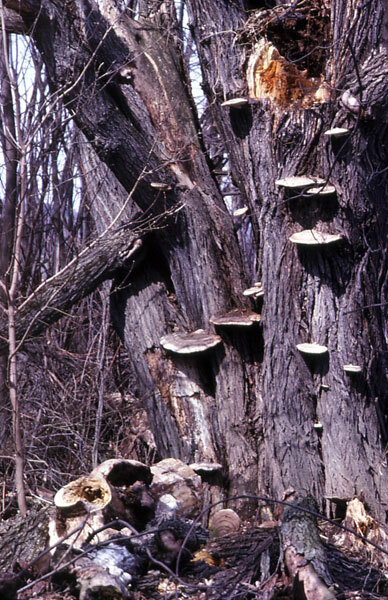 One of the prominent features is the dead tree in the right side background. 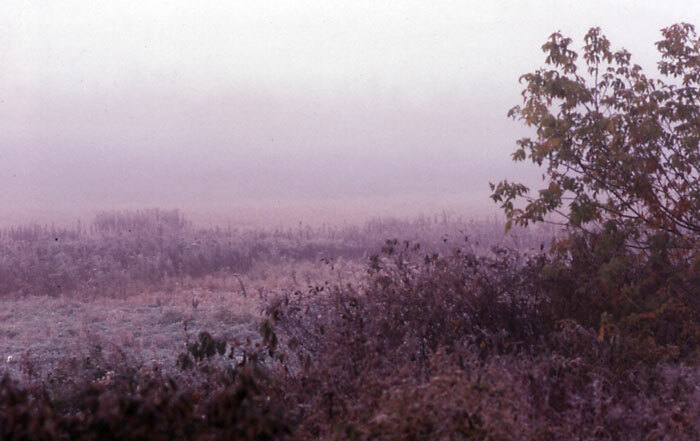 The ironweed, best known as New York Ironweed, was a rapid growing plant and came up early in the spring. The new shoots sometimes were nipped by a late frost but that didn’t stop them. The stalks were hollow and not particularly strong. Stalks from the previous year can be seen near the ground. 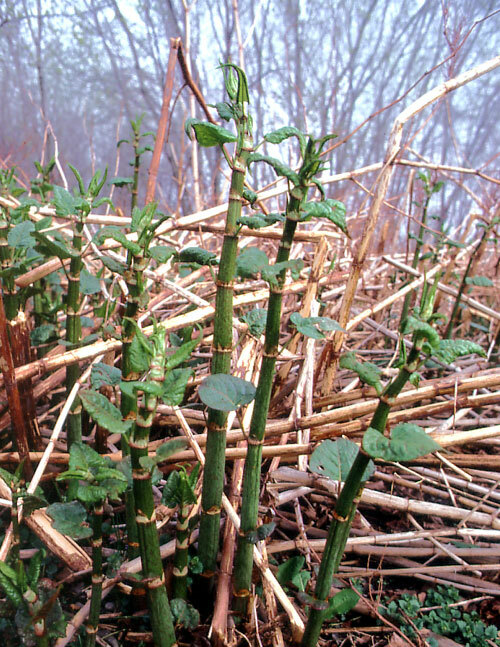 It reached heights of up to 8 feet—sort of like bamboo. Here is that unknown tree. It was long since dead when I found it and occasionally more branches would fall to the ground. 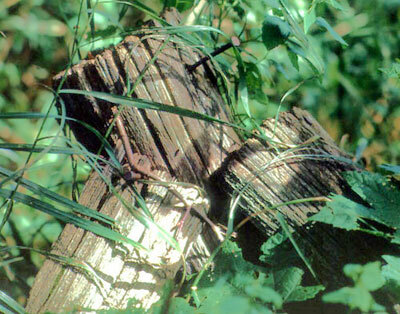 The yellow-brown area in the upper right of the right hand picture is where a branch recently fallen off. 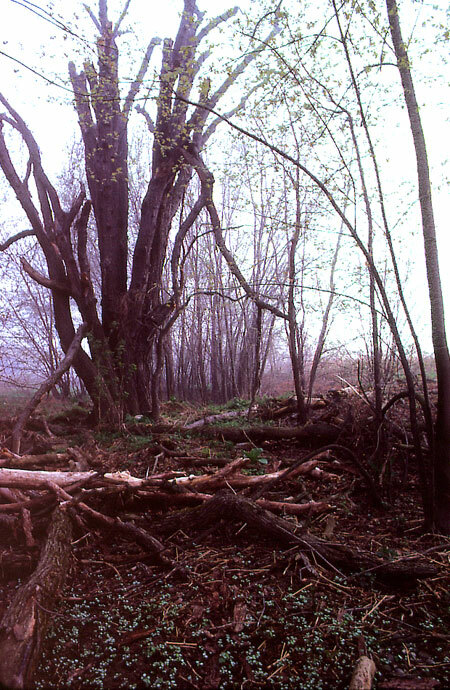 The trees all grew in an area that often flooded when the Chenango River got too high. 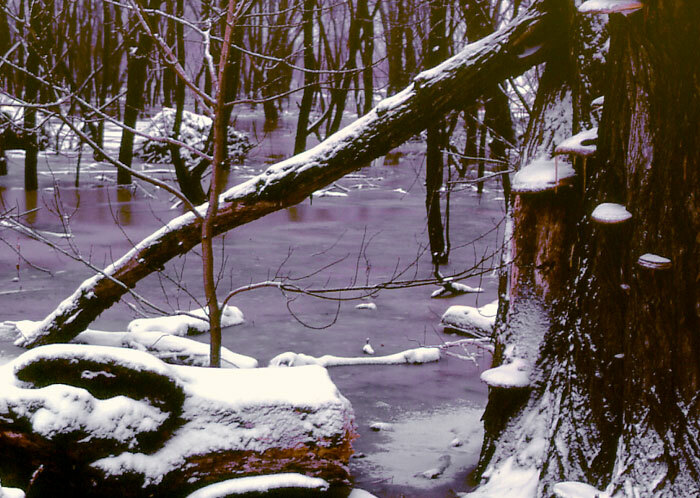 Here is the woods during one winter flood. I discovered this one day and the scene struck me as very spectacular. 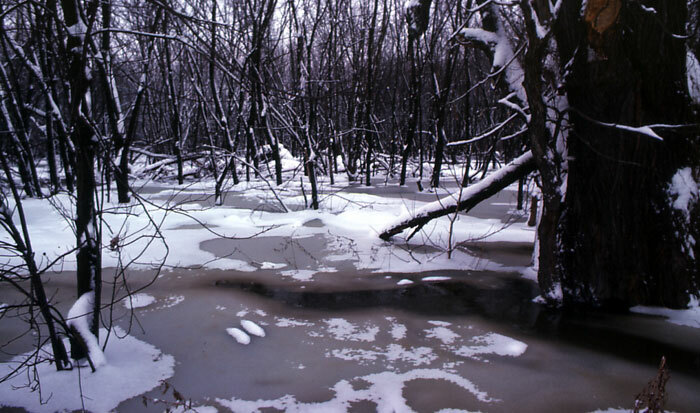 The whole area was a combination of wet, black trees, gray snow-filled water and white snow. No other colors were apparent. It was like looking all around into a different world. I left home early several mornings after a snowfall to photograph this scene and the flooded area around it. Later, I found that photos showed up best in black & white. At that time I was using a Mamiya C330f twin-lens medium format camera for B&W and a Nikkormat 35mm camera for slides. The light was not that strong in early morning on a cloudy day and a tripod was necessary. My gadget bag hung on the tripod and the camera screwed in at the top of the pan head. 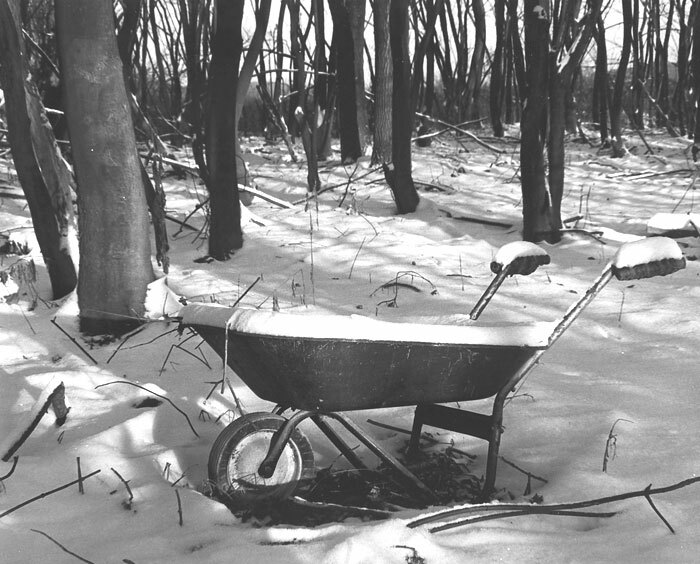 This wheelbarrow has been standing out in the woods for a long time and has apparently been forgotten. The branch appears to have been on it for some time as well as the leaves inside. It was still there in the winter. I wonder who put it there and why they left it in the middle of the woods where it would not be easily found. Certainly, at least one person knew the reason. One day, when the river was low, I walked way back in the Barjo woods towards the river. I discovered what I can only describe as a clubhouse that must have been built by some local kids. They had wisely put it on stilts. The area could be all flooded in the spring. The only entrance was from underneath and there were no windows but I would expect there were some handy peep holes. 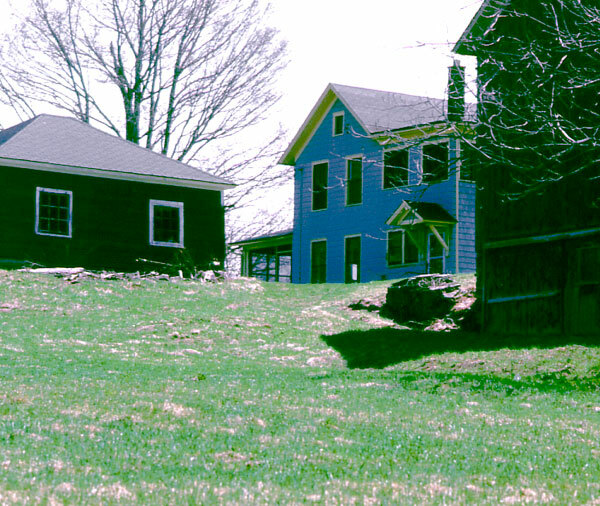 Across the Brandywine Highway and up to the north a little bit and then up an embankment there are a few trees and bushes and then a farm house. On the way I noticed this fungus growing on a tree. Not far away was another unusual fungus that I guess is a sort of toadstool. 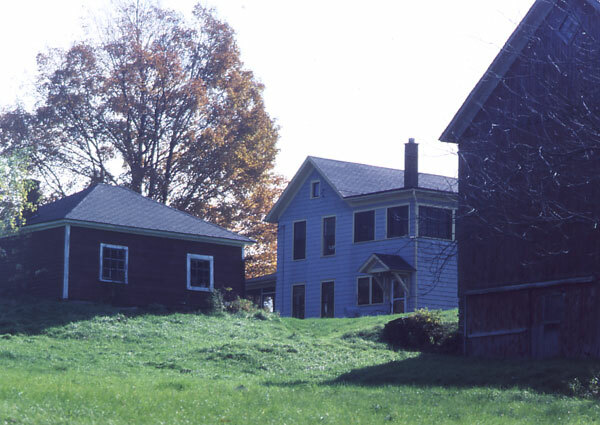 The Farm is composed of several buildings. They were located on Cornell Avenue that runs parallel with the Brandywine Highway. This picture was taken in early spring. 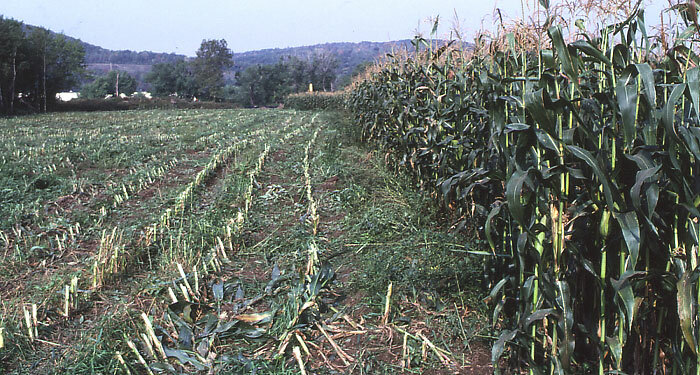 In the fall, the grass had grown very high. I don’t think anyone bothered to mow it, at least in the back yard. 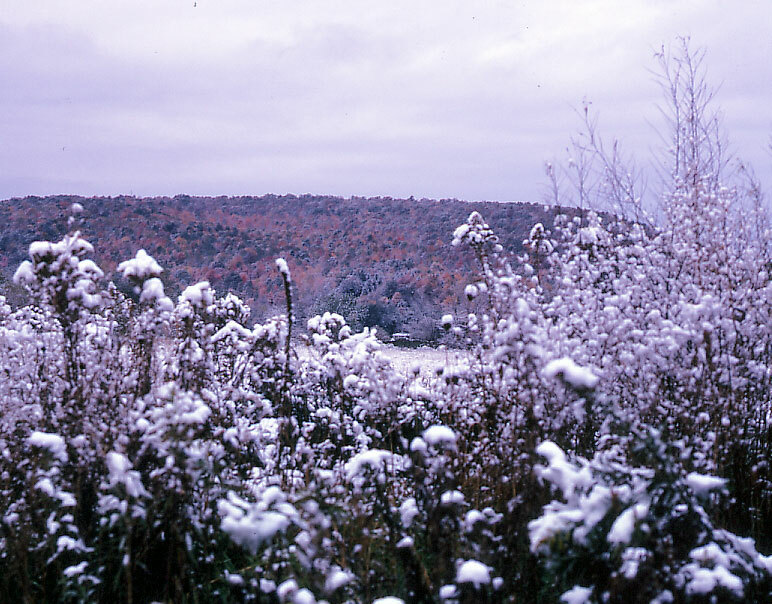 This is one of those gray overcast days in upstate New York when there has been a recent snow. After this, the wind could start to blow and the temperature start to go down. 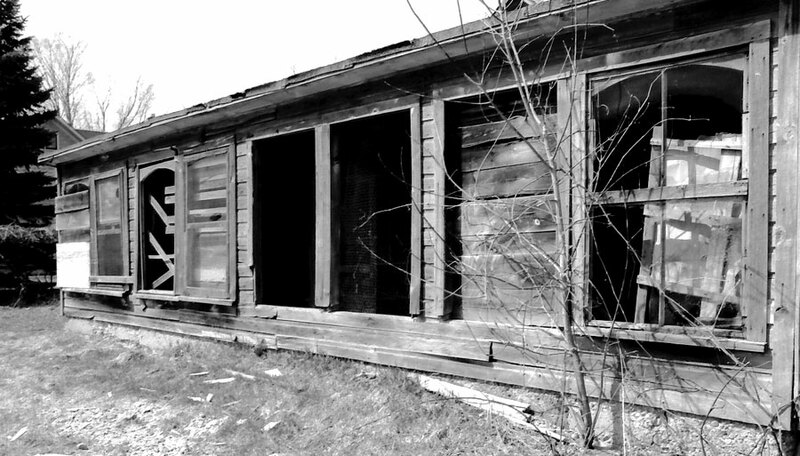 In back of the barn were old unused buildings, some of which had collapsed. Perhaps this was an active farm one day but maybe the owners had grown older and this part of the property was uncared for. None of this was visible from the house or from the street—out of sight, out of mind. Near the collapsed shed there was an old apple tree. It looked like it had not been taken care of for many years. Despite all of this, the old tree managed to put out a myriad of beautiful blossoms in the spring. 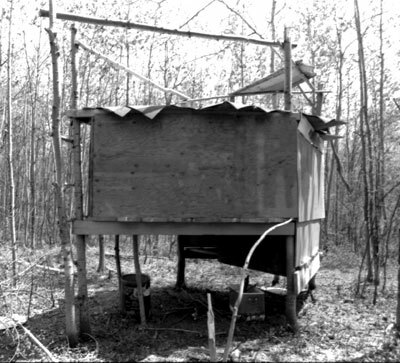 What must have been the chicken house was still standing to provide some interesting pictures. 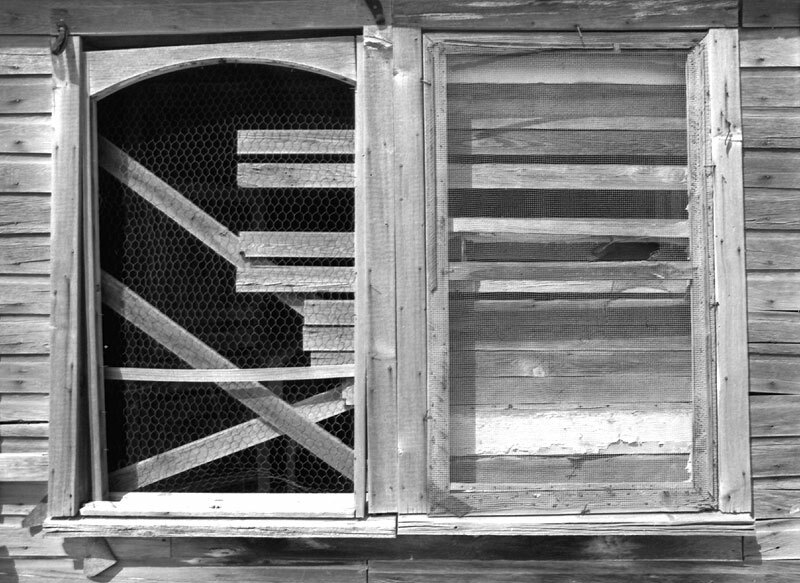 Sometimes it is a matter of preference to make a picture in black & white that has many different gray tones instead of color. Anyway, the windows were still interesting to look at. Even a close-up in color revealed some interesting textures. 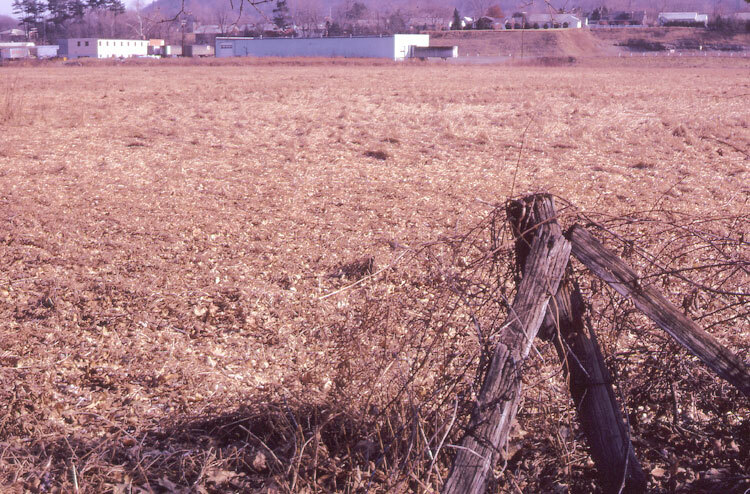 Directly across the street from Plant 5 and just south of the farmhouse was a small deserted building that may have been a gas station at one time but was fenced in. It was in an area that had been cleared out of the hillside to be at the same level as the highway. One day I walked over to see the curious hillside that was visible as I drove by in the mornings. The feature that first attracted my attention was the odd overhang near the top. 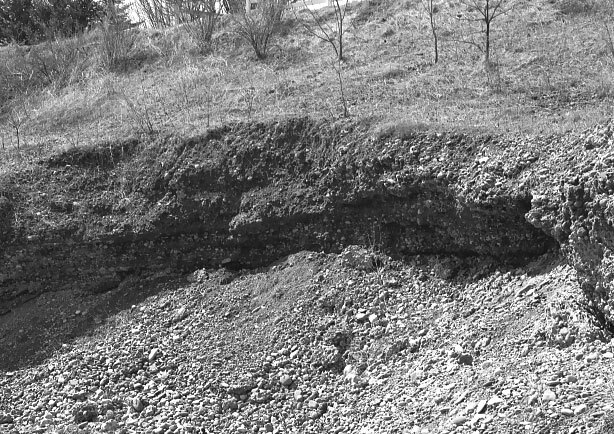 This is not the way a bank of soil and gravel normally behaves. It was not solid rock and the small stones should have fallen down instead of staying in place. Apparently, some of the solid area had weathered over the years and dissolved the binder, allowing some of the gravel to fall down. 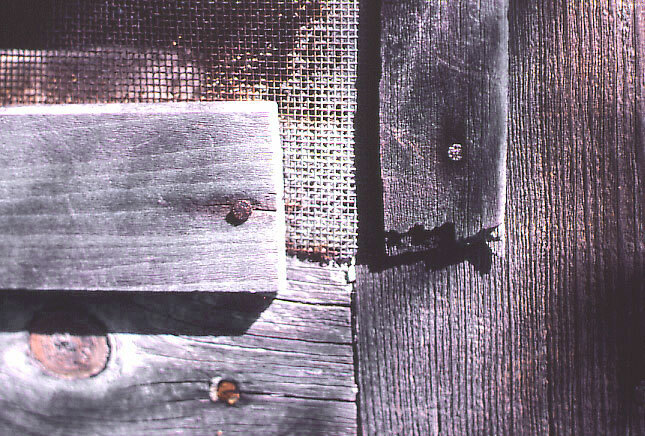 Here is a picture of a vertical face with the rounded stones still held in place. I took the pictures not knowing at this time why the formation was so unique. The material that held the stones in place was not dirt but was not cement either. I took some samples to save. 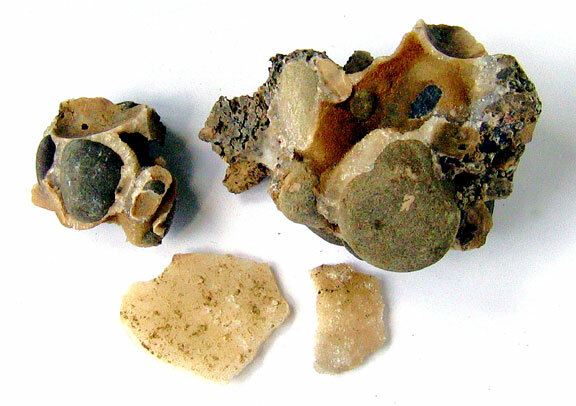 In the picture, you can see that the stones and sand are held together with an orange-whitish material. 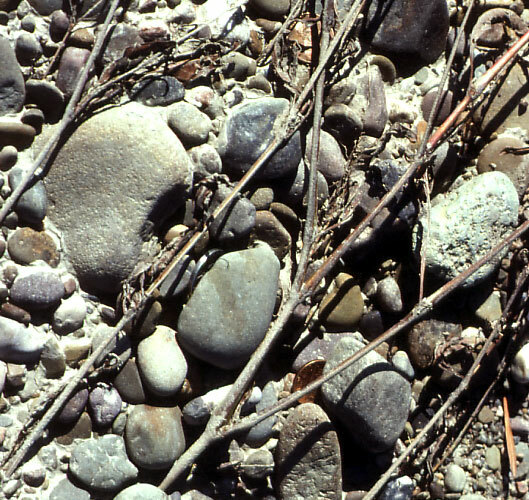 The book describes this as a conglomerate of glacial till composed of rounded pebbles 1\4” across or larger, cemented together in a matrix of finer material. The cement may be iron oxide, silica or calcium carbonate. 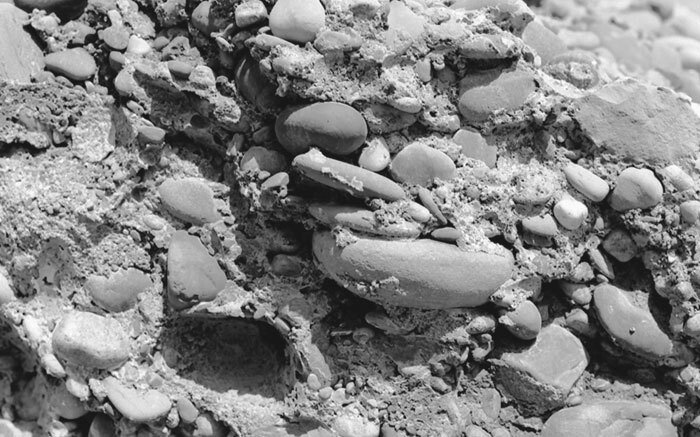 The coarse materials are deposited close to shore at the mouths of swift rivers in alluvial fans or in deltas. The material was laid down in valleys by rivers that drained away from the glaciers, and in glacial lakes. The location of the conglomerates is cited as New York State. 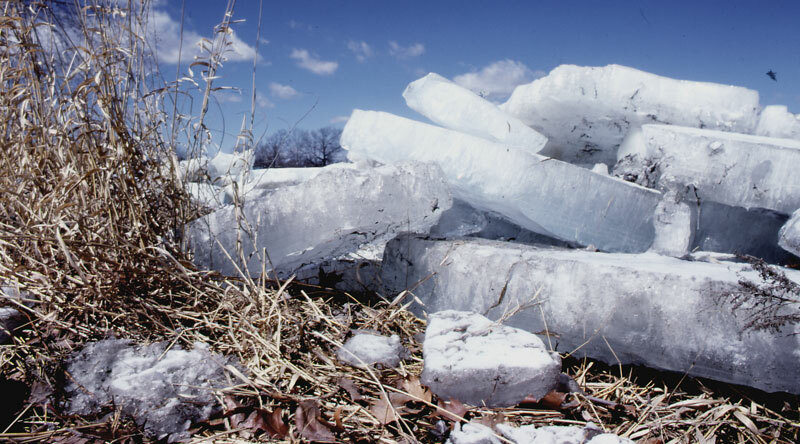 This glacial conglomerate was formed in the last ice age about 11,000 years ago, along with the Finger Lakes, Great Lakes, Cape Cod, Nantucket and Martha’s Vineyard. The rounded stones, of course, indicated that they had been tumbled by the glacial river over a long period of time. 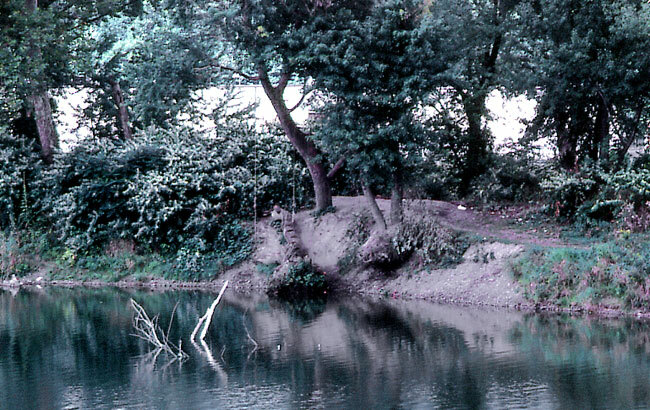 As the river subsided, the water evaporated from the edges, concentrating the binder that was dissolved in the water so it would become a solid and hold the gravel together all of those years. We left Plant 5 in the fall of 1979. When I rode up to Plant 5 a little more than a year later, I found the field completely plowed up. After all the years of working at Plant 5, the field had remained undisturbed. What a surprise to see it being used. 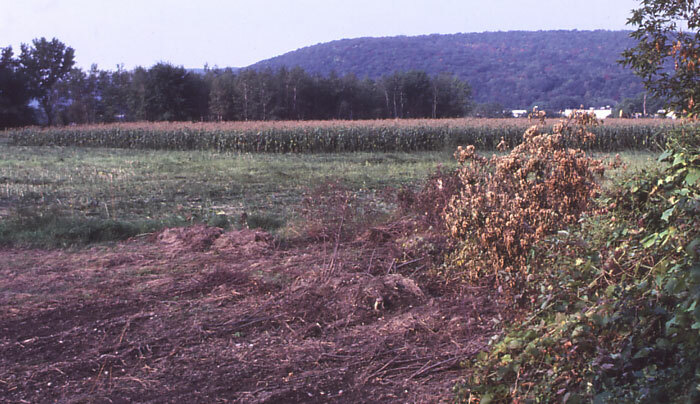 In addition, the wooded area including the fence post and Burr oaks across the field were completely gone. The rich topsoil was being excavated to a depth of about 10 feet and probably sold. I often wondered where builders got their topsoil.. Plant 5 is almost completely hidden by trees that had grown. 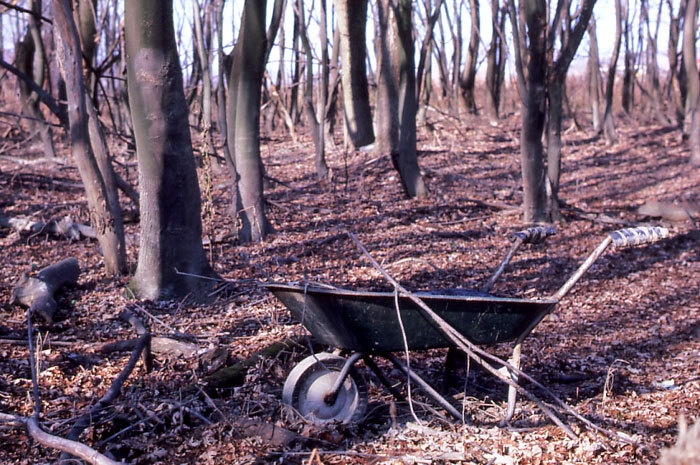 In addition, the whole flood area was being excavated, even the Barjo woods. River bed gravel was still being removed as well. So this was the end of the place that was home for me almost every noon time for over 6 years. There is no more Burr oak or wild flowers or ferns, but it is still preserved by my pictures and descriptions of the happy times I spent exploring and photographing. Not only was the field and flood area changed but the farmhouse area was as well. 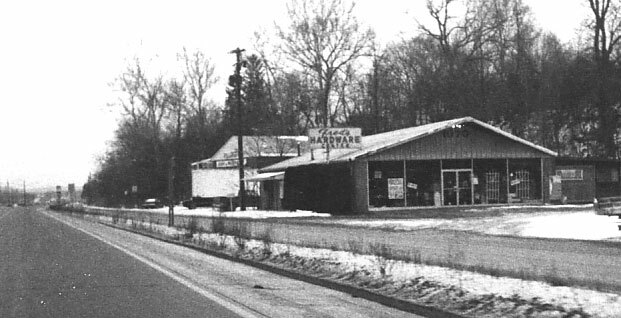 A few years later, Interstate 88 was constructed in place of the Brandywine Highway. It brought a smile to my face when the news reported that the construction was delayed in the area of the conglomerate. Apparently no one had thoroughly investigated the ground there, but I had. It was not just dirt and gravel but was more like concrete and could have required blasting. 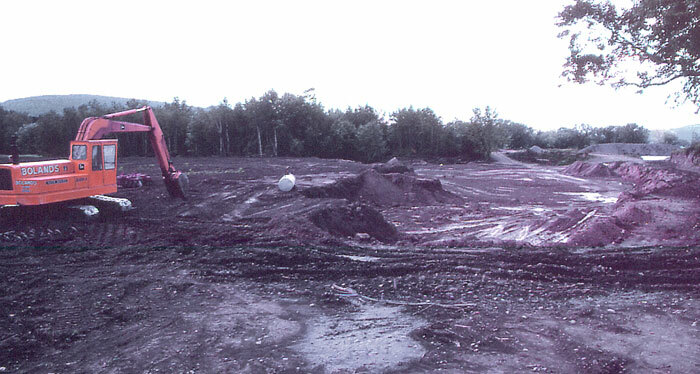 Today, in 2009, almost 30 years later, all the topsoil had been removed from the field, woods, Barjo woods and perhaps more to the north and south. 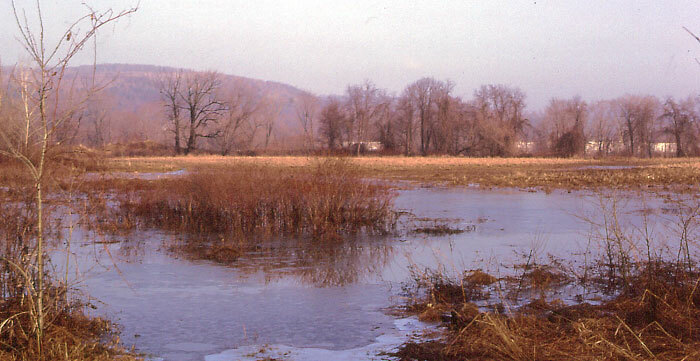 The whole area is now filled with water from the Chenango River year-round. The plant 5 building is still there but has an addition all along the back and also at the north end. 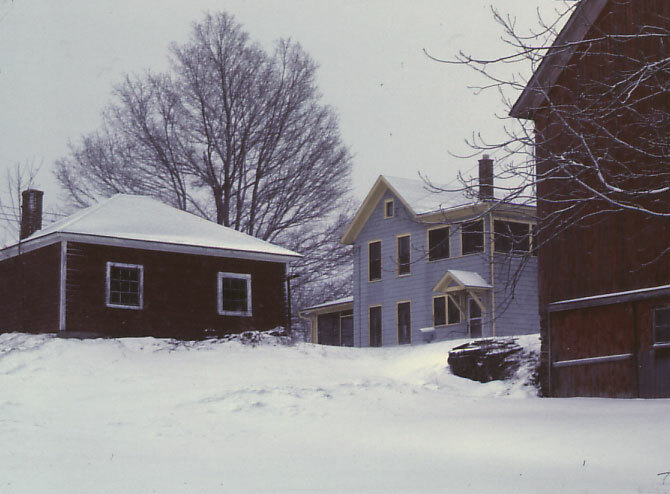 The Interstate and Albany-Binghamton buildings are still there. 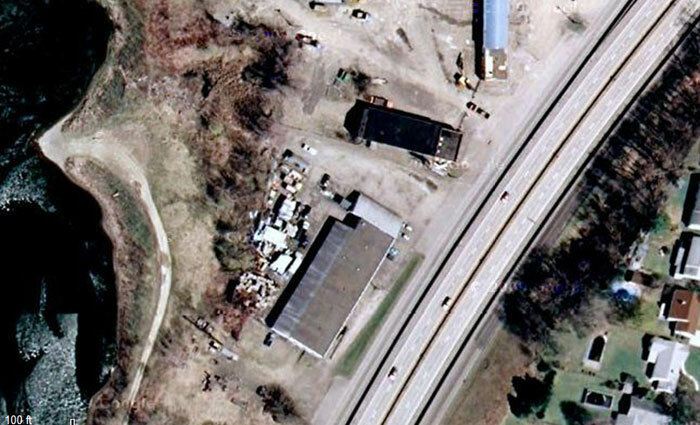 In 2009, this ariel photo shows Plant 5 with the gray-colored roof and what appears to be an enormous amount of junk piled up behind it. The field that used to be to the left side is almost all water all the way to the Chenango River that is much further to the left beyond the picture. The black roofed building above Plant 5 is the Interstate trucking building. I-88 is the main road shown at the right. The dark lines are actually shadows cast by the high concrete barriers isolating the road on each side and between the lanes. The side arterial roads are still there on either side of the I-88 barriers. Fortunately, we had moved out of Plant 5 long before the construction started and avoided all of the problems getting to and from work. This is the end of my adventures around Plant 5. After moving the speaker lab to Plant 4, next to the main plant, I found new and different places for a noon-time walk and to take pictures. More text and pictures will be added as my research continues.